Remove leaves from large head of cabbage carefully. Place in large pot, cover with boiling water and simmer 5 minutes. Drain. Soak broken matzo in the 1/2 cup water until soft. Combine this mixture with ground meat and egg. Place a heaping tablespoon of this mixture in the center of each cabbage leaf. Fold in the sides to cover meat; roll. 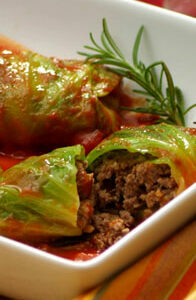 Place cabbage rolls in a large saucepan with open sides down. Combine remaining ingredients and pour over cabbage rolls. Cover; bring to a boil and then reduce heat. Simmer about 1 1/2 hours, basting occasionally. * For sugarless Holishkes, omit the sugar and substitute 16 Sucary tablets. ** 3/4 cup matzo farfel may be used instead.